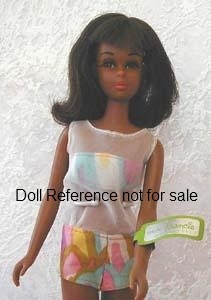 Vintage Francie doll is Barbie's Mod'ern cousin and is 11 1/4" tall, she was first introduced to the Mattel Barbie family of dolls in 1966. Francie has a slimmer body style and more modest bust line than cousin Barbie, thus she has her own clothing line which later on, she will share with her pals and same sized dolls Casey and Twiggy. See the images an full descriptions below of how the Francie doll evolved over the years. 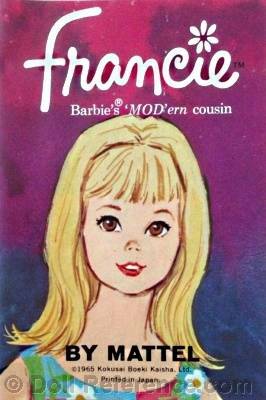 Francie doll was the first to have rooted eye lashes in the Barbie doll family, she has brown painted eyes, a grayish-tan skin tone, blonde or brunette shoulder length "flip" hair length with bangs, and bendable legs. 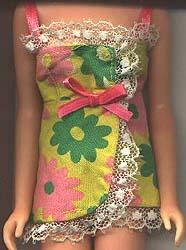 Wearing a one piece helenca swimsuit that is white knit with green and pink blocks and scattered daisy flowers. Some of the first issue had a turquoise background others the white also, white soft pointed toe low heel shoes, a HTF white or pink eyelash brush, black wire stand. Mark: © 1965 Mattel, Inc. U.S. Patented U.S. Pat. Pend. Made in Japan (some have "U.S. Pat'd" on the third line). 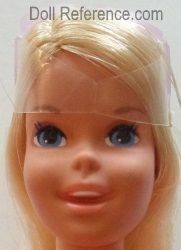 (2nd Issue) Rooted eye lashes, brown painted eyes, new pinker skin tone, blonde or brunette flip shoulder length hair style with bangs, and bendable legs. Swimsuit is one-piece white patterned background top (same pattern as first issue), and dark green solid bottom, white soft pointed toe low heel shoes, HTF white or pink eyelash brush, black wire stand. Same mark as early 1966. 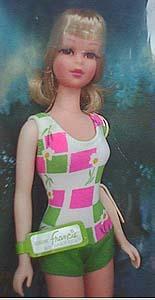 This Francie doll has painted eyelashes, brown painted eyes, pink skin tone with brown or blonde flip shoulder length hair style with bangs, straight legs, wearing a two piece red and white swimsuit with polka dot top and checked bottom, eyelash brush (some had them, others not), HTF red soft pointed toe low heel shoes and gold wire stand. Mark: © 1965 Mattel, Inc. U.S. Patented U.S. Pat. Pend. Made in Japan. This Francie did not sell well originally, so fewer Francie as a black doll were produced and are very highly prized by collectors today. Wearing a sheer white and swirl fabric cover-up, and same fabric swim top. First version had rusty reddish shoulder length hair, rooted lashes, light brown painted eyes, the second version had dark brown below the shoulder length hair and darker brown eyes, both dolls have a twist and turn waist and bendable legs, eyelash brush, clear X stand, but no shoes were included. 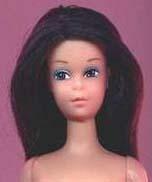 Blonde or brunette shoulder length hair, brown painted eyes, twist and turn waist, rooted eyelashes, and bendable legs. Swimsuit is one-piece striped top, solid pink bottom with an attached green vinyl belt with gold buckle, clear X stand, (no shoes). Mark: ©1966 Mattel, Inc. U.S. patented U.S. Pat. Pend. Made in Japan. New shorter flip hair style in brunette or blonde, new one piece swimsuit, pink solid top with two gold beads, yellow vinyl high waist band, pink and yellow diagonal stripe bottom, pink (blonde hair color) or yellow (brunette hair color) elastic headband, clear X stand, (no shoes). Same short flip hair-do as in 1969, now has a new two piece yellow with green and pink flowers side closing top trimmed with lace, pink vinyl shorts, rest same as 1969, inc. mark (no shoes). New flip no bangs hair style, orange headband, brown painted eyes, real eyelashes, orange pleated mini dress, edged in white vinyl, orange headband, white soft squishy pointed toe low heel shoes with molded buckles, rest of doll same as 1970 inc. mark. 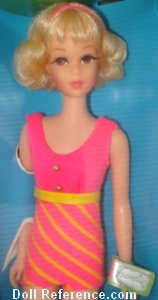 Twist and turn waist, bendable knees, short blonde hair with bangs and a blue ribbon headband, painted brown eyes, four extra blonde hair pieces, blue dress with white crochet trim, aqua soft low heel shoes. Paler lips & fluffier hair in 1971-1972. Rooted eyelashes, painted brown eyes, bendable legs, short pink metallic top & net overskirt party dress, low pink closed toe heel shoes, same hands as Barbie mold with divided fingers, no extra hair pieces. A center section of her hair can be pulled and becomes very long, or can be retracted, back to short. Same doll as above with new stock number, rooted eyelashes, different hand mold, slender and undivided fingers, new box & two extra hair pieces, same marks as above. Casey head mold, suntan skin tone, painted blue eyes, painted lashes, straight blonde hair, bendable knees, twist waist, one piece rose top & red bottom swimsuit, orange towel & sunglasses, (no shoes). Mark: © 1966 Mattel, Inc.
About the same as above doll, new marking. Towel and sunglasses were discontinued in 1975 and a new white box. A new rose box in 1976 (doll shown) rest same as 1975. There was also a Francie Sun Set Malibu or Francie Sun Sun made only for the Japan market that had the regular Francie head mold with a sun tan body. New Mark: © 1966 Mattel, Inc. U.S. Patented U.S. Pat. Pend. Made in Korea. New hands with a moveable thumb to grasp & hold items, twist waist, bendable knees, bend elbows, painted eyelashes, long blonde hair, feathered around her face, painted brown eyes. Wore blue jeans, green tank top, green ribbon, green heel shoes, red belt, clear stand. Also a telephone, T.V., record player, travel case and tray with two glasses, all brown plastic. 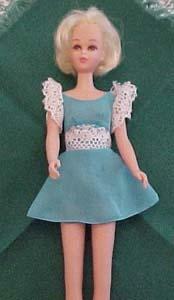 Different head mold for Francie and only sold in Germany, blonde rooted hair, painted blue eyes, she wore a brown linen sleeveless mini dress with stitched on brown cloth belt with white top stitching, white collar, with two white buttons below, blue hair ribbon, white tricot knee-hi socks and brown low closed toe heels. Same head mold and hair color as the regular German Francie 8520, but now Francie Busy wears a blue and red peasant dress, red hair ribbon, navy square toe low heels and came with the same busy hands and accessories as the USA doll; a telephone, T. V., record player, travel case and tray with two glasses, all brown plastic. © 1966 Mattel, Inc. U.S. Patented U.S. Pat. Pend. Made in Japan. Long brunette quick curl hair, painted eyelashes, brown eyes, twist waist, bendable knees, long yellow and white gingham short sleeved dress, white shoes, comb and brush, curler, four ribbons, four rubber bands, bobby pins, booklet and clear posing stand. Mark: © 1966 Mattel, Inc. Taiwan U.S. Foreign Patented Other Pat's. Pending. Packaged in clear plastic bag, with cardboard header stapled to top, "Baggies" is the collector term. 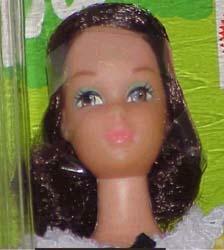 Doll has painted lashes, brown eyes, straight legs and non-twist waist, long straight brown hair. Wore a two-piece swimsuit in yellow tricot, (no shoes). 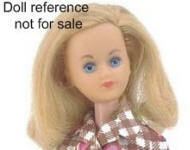 If yours has blonde hair then she's a Casey doll #9000.